"I laughed when I saw it," said Judson Phillips, founder of the Tea Party Nation, which commands a large following in the movement. And FreedomWorks, the national grassroots organizing group that's supported the movement over the past five years, appeared to describe the move as sophomoric. "It's not pledge week, these are peoples lives we are talking about," said FreedomWorks Communications Director Jackie Bodnar. Organizing For Action, which was formed in early 2013 out of the remnants of Obama's 2012 re-election campaign, started Monday to mail to supporters bumper stickers that spoof the Gadsden flag, which has been informally adopted by the tea party movement. The historic flag, which dates back to the American Revolution, depicts a rattlesnake in a position ready to strike over a yellow background, with the words "Don't tread on me" at the bottom. 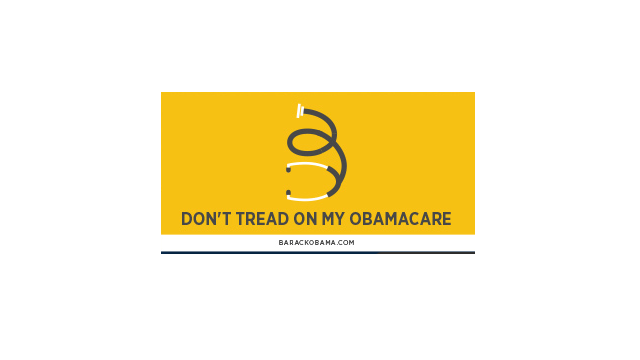 OFA's bumper sticker, which replaces the rattlesnake with a coiled stethoscope with the words "Don't tread on my Obamacare" below, is being mailed to those who have connected with the group through Facebook. The OFA promotion is part of a bigger push to boost enrollment in the Affordable Care Act, better known as Obamacare, ahead of the March 31 deadline. Tea party activists have long opposed the health care measure. "While OFA is mocking the tea party and American people who proudly fly the Gadsden Flag, they need to realize We The People will not surrender to this administration's attack on our freedom and liberty, through the overhaul of our health care system. Let their little stethoscope sticker supporting Obamacare be a reminder of that," Kremer told CNN. "OFA is so desperate for a message of any kind, they want to troll off of one of the Tea Party's main symbols. There is an old truism, when you enemy is self destructing, don't get in their way. I think they wanted to provoke a reaction from the Tea Party. But Obamacare and Obama are sinking the Democrats, OFA and the left, I say just stay out of the way and watch them fail," Phillips added. "I'd like to see some real solutions from the Democrats and the White House, rather than twerking GIFs and ironic bumper stickers," added Bodnar. "There was no Tea Party before Obama, and there will be no Tea Party after he leaves office. All this horsespit about "taxed enough already" is a smokescreen for their racist blathering. They just want to beat up a few black people. When they get into office all they do is posture and promise to overthrow the administration and then they do nothing and aren't re-elected"
I remember my dad talking about unfair taxation, a growing government with too much over reach, and the debt all the way back in the 1960's. Not one word ever about black people. Not one word about race. Ever. The spirit of my father lives on in the Tea Party today. So they got organized, but it was never about race. It's about the federal government that's greatly over stepping its bounds of authority. Do you think that only your side should have a strong voice? Laugh at them all you want, but the Tea Party is on the right track with their opposition to the actions of today's governing. The Tea Bagger co opt of the Gadsden Flag and the Tea Party are both way out of line. As a Bostonian by birth and education, I truly resent a bunch of semi-literate rednecks naming themselves for a moment in the history of my city. The Gadsden flag is not a trademarked symbol of any group. It's one of the original flags of our nation. It belongs to all Americans. It amusing that those on the Left love to criticize anyone who disagrees with Obama as racist.. Perhaps amusing isn't the appropriate term...maybe intolerant of those different than themselves? gee...that's a LIBERAL thing to do! Desperate times - desperate tactics! Obamacare is an insidious snake – off with its head! I'm afraid the Tea Party won't go away until they destroy the USA. I have heard nothing but imbicilic ideas come from these people. Poor Tea People, they steal a flag now it gets stolen back by others. The originators of that motto "Don't tread on me" were the Marines in Philadelphia in the 1700's. The Tea Party stole if from them. Anyone can use that saying. I love it. The Tea Party steals a motto and complains when someone else steals it, too. The Tea Party isn't a party, they shouldn't be referred to one until the register and follow the law. Liberals not clever enough to come up with their own logo? And btw, why save a bill that clearly is a mistake that's hurting more americans than helping them. Tea party is what happens when a bunch of rich people are paranoid and loose their minds. These are the same people who still would support slavery. Maybe their symbol should be a goat and a bottle of KY. That fits most people in the government now a days. Tea Party gives us senior citizens a bad name. Seems that all I see at those rally's on TV is a sea of white hair. Now this idiocy as if they have any claim at all to the Gadsden flag. Some claim they will go away with the election of a new president. Really? Do you promise? What if our new president has an hispanic heritage, what if he is catholic, what if SHE is black or a paraplegic? There is only a handful of perfect people in this world and they have laid claim to the name of the original band of rebels although their behavior is is more like what you would find at a KKK rally. It's "Don't tread on me" not "Don't tread on us" so to keep in the proper context it has to be "my". They are really creative aren't they??? That image is older than America, the Tea Party used it as a symbol of the government treading on them, I see it as a symbol of The Tea Party pukes seditious aims!!! The Obama folks should have ben more imaginative!!! 90% of the people who make up OFA chose to pay the fine instead of enrolling in Obamacare, that's the irony. Hogan – Keep dropping the racist bombs. The more you do it the less clout it carries. Don't take it out on the rest of us because Obama lied to you, me, and the rest of America. What is the complaint? It's not like the supporters of the ACA are going around parading in tricorn hats! These symbols of our American revolution belong to all Americans, and in fact, they have been sullied by their association with the Tea Party. The Democrats just can't put enough lipstick on this pig. If find and replace "grassroots" with "astroturf" this article becomes more accurate. There is no health care and there is no system.